How will you manage your legacy in an age of technology and information explosion? Over the past 10 years, there has been an explosion of technology and information. Our lives are moving faster and growing more complex. We are bombarded with a flood of messages, emails, voicemails, and people wanting us to do things. We are constantly nagged by the things we forget to do or should be doing. Are you prepared to stay organized and efficient in a fast paced ever changing world? Most of our established and familiar routines for being productive were created and popularized over 20-years ago, and leave us unprepared for the speed, volume and complexity of our work and our lives. Being unprepared causes worry, stress and overwhelm. We commonly think that there is something wrong with us. In fact, we simply do not have tools and practices to deal powerfully with this faster, more complex environment. We are left struggling to “get caught up” in a world where getting everything done is impossible. Experience a dramatic increase in your productivity, a lift in your life, power and peace of mind. Get done what you say you will, and complete things on time. Increase your ability to focus, be more decisive, make better decisions and create more choices. 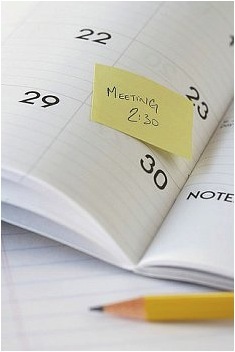 Stop waisting time, structure your calendar effectively. Disappear stress, anxiety and overwhelm. Communicate effectively, be more effective, and produce powerful results.